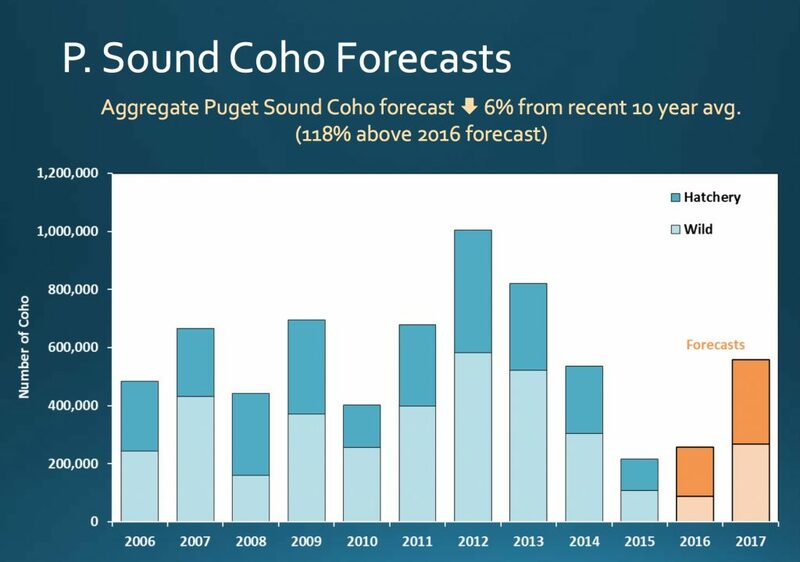 Total returns of coho salmon to Puget Sound this year are expected to be significantly higher than last year, and that should help smooth negotiations between state and tribal salmon managers working to establish this year’s fishing seasons. But critically low runs of coho to the Skagit and Stillaguamish rivers in Northern Puget Sound could limit fishing opportunities in other areas, as managers try to reduce fishing pressure on coho making their way back to those rivers. 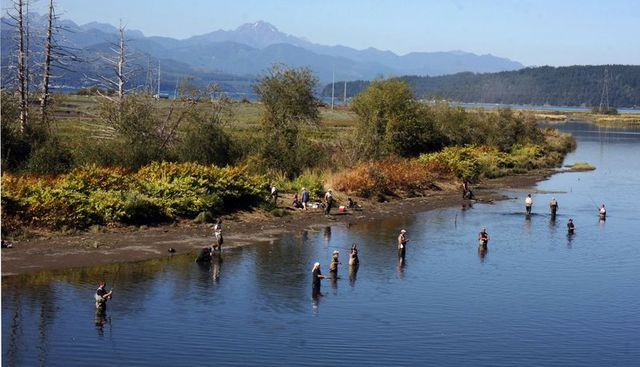 In any case, both state and tribal managers say they are confident that they can avoid the kind of deadlock over coho they found themselves in last year, when a failure to reach agreement delayed sport fishing seasons and threatened to cancel them altogether. See reporter Tristan Baurick’s stories in the Kitsap Sun, May 4 and May 28. “We’re in a much better situation than we were last year,” Ryan Lothrop, a salmon manager with Washington Department of Fish and Wildlife, told a large gathering of sport and commercial fishermen yesterday in Olympia. 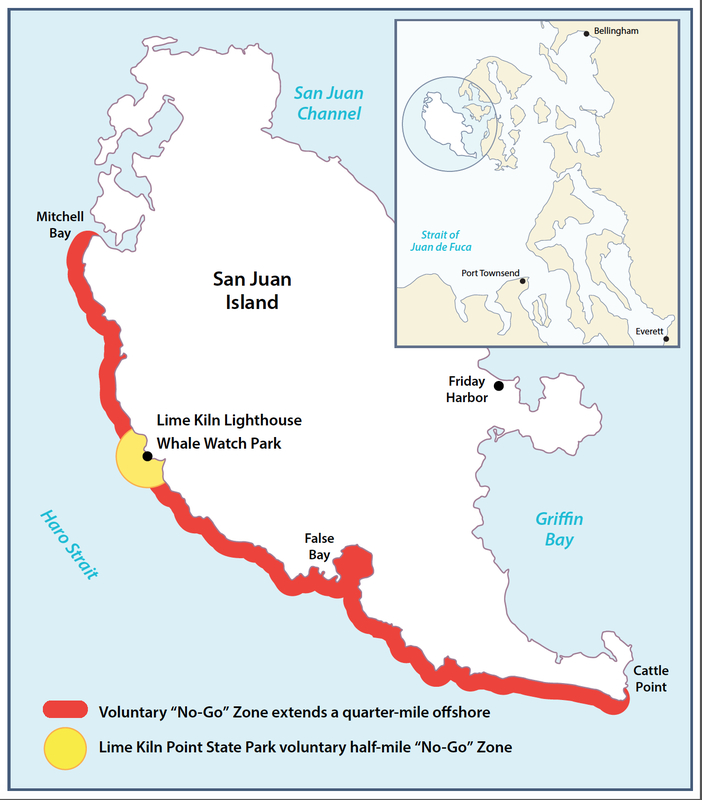 Details are still being compiled for Puget Salmon salmon fishing this summer and fall, but it appears that anglers will get some additional time on the water thanks to mark-selective fishing. In years past, we reporters received a flood of regulatory documents from the Washington Department of Natural Resources on the night that work was completed at the six-day Pacific Fishery Management Council meeting. But in the rush to get the rules out the door, those compiling the information often got certain details wrong, and I often noticed discrepancies and typographical errors because of the amount of information being shuffled around. Last year, WDFW officials decided they would take another couple of days to double-check the information to avoid confusion at the outset. The PFMC finalized the regulations yesterday. As far as I can tell, the story I wrote for Tuesday’s Kitsap Sun still holds up, but I’ll admit it was not very detailed. Neither is the news release sent out last night by WDFW, but it covers a little more ground than my story. “For the second year in a row, the Pacific Fishery Management Council today closed commercial and most recreational salmon fisheries off the coast of California in response to the collapse of Sacramento River fall Chinook,” the news release states. Last year, the federal government declared the California fishery a disaster, and Congress appropriated $170 million in aid. I’ll let you know as soon as more details regarding Puget Sound come out.